Anyway, I'm here to tell you that last night's Antony and The Johnsons/Manchester Camerata concert at Manchester Opera House was a real experience. In his flowing white gown, Antony Hegarty was an angel, big and wise and sad. He has that peculiar quality of otherness that David Bowie has - as if he is visiting us from another planet or another time, watching our downfall with a powerless sorrow. And at the opera house, with the full powers of the Manchester International Festival at work, you really felt like you were seeing him perform in the best and most fully-realised way. The lights, the set, the whole staging of the performance was incredible. 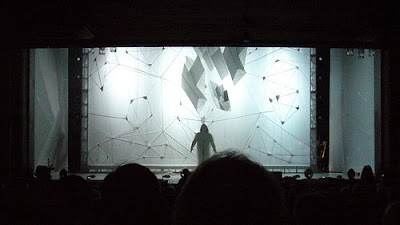 The set featured a white kite-like structure suspended above him where he stood at the centre of a multilayered set with a series of scrims that went up as the night progressed, only revealing the orchestera near the end. The lighting did something different for every song, weaving facets, veins and bouncing prisms of light. Hegarty explained it as the manifestation of "my dream of what it's like to live at the centre of a mountain." The overall effect was weirdly powerful. I hadn't heard any of the songs in The Crying Light before, so it's a testament to Hegarty and composer/arranger Nico Mulhy that I found every song completely engaging. And this was a million miles away from the soupy arrangements you often get when pop singers do the orchestra concert thing. The Camerata provided a lot more than a musical backdrop, at times working as a surprisingly complicated foil to Hegarty's melody, at other times creating something very different on its own. Hegarty strayed from the new material to give us a joyous For Today I Am A Boy and an intense Cripple and The Starfish. And we had the unexpected pleasure of a gleefully deranged cover of Beyonce's Crazy In Love, reimagined as a dirge of doomed obsession. But, for me, the high point was Another World, when he stood against a dark background studded with red pinpricks and flares of light like a starfield. Against a sustained drone, as if emphasizing the emptiness of space, Hegarty sang words chilling in their simple truth: "I need another world. This one's nearly gone." Listening to him, you feel like he's more than halfway there. I was there and it was indeed gorgeous. He is a rare beauty. Oh I so wish I could have gone to this. We had two tickets but no childcare so I got the short straw. My husband said it was amazing, but not as lyrically as you did! !